There are a host of reasons for visiting Tenerife – the largest of the Canaries, which the classicists rightly called ‘the Fortunate Isles’. Fortunate, too, in having such a wonderful winter and spring climate for visitors from the freezing north! An island of contrasts – the miles of sun-drenched coastline surround Spain’s highest mountain (over 12000 ft), Mount Teide. Accessible by cable car and often snowcapped, the desolate volcanic slopes within Teide’s National Park are a world away from the tropical vegetation of the green Orotava valley, and the botanical gardens below. You stay in the north part of the island where the traditional villages and the University town of La Laguna have a totally different feel to the commercial concreted resorts of the south – and the lush, tropical landscape with banana plantations also contrasts with the arid terrain of the south. Day One: Flight to Tenerife, transfer to your hotel (about one hour away) for seven nights half board accommodation. Your holiday base is close to Puerto de la Cruz (with its agreeable and historical maritime area) and to the verdant Orotava valley, whose eponymous town boasts the attractive mansions of families who made their fortune trading with the New World – and then spent fortunes building fine houses and churches in their home town to show how successful they were! 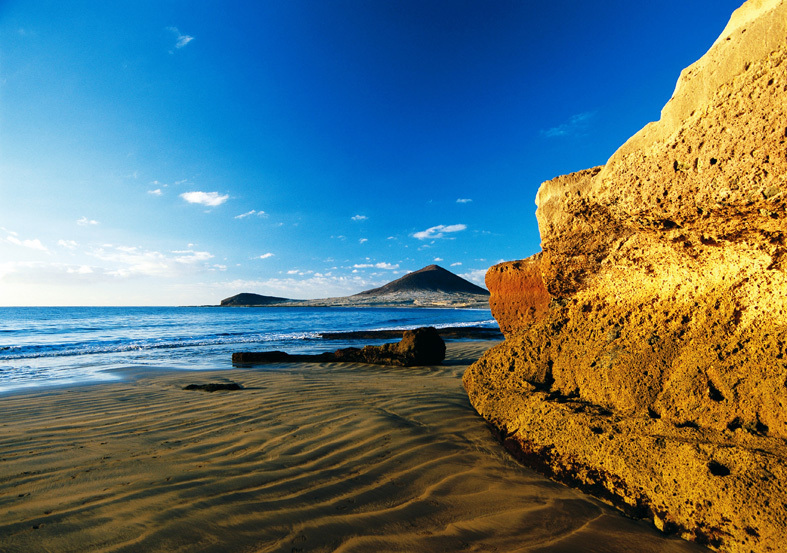 Tenerife still has undiscovered corners, like Garachico, out to the west. Garachico is a typical Canarian village, whose harbour was filled in by a lava flow in the 18th century – since when, as you stroll the shady square, you get the impression that, frankly, not a lot has changed! Also within easy reach is Santa Cruz de Tenerife, with Calatrava’s futuristic new ship-shaped auditorium and a pleasant old quarter: beyond the town lie the spectacular Anaga mountains. In resort with three included excursions. Mount Teide: you will have a scenic drive on Mount Teide, with a stop to explore the volcanic landscape of the Ucanca plain, and the chance to take the cable car up the mountain (cost of cable car approx. 22E). La Laguna: an included excursion will take you to San Cristobal de la Laguna (to give it its full name). The fine Canarian Mansions scattered through the town offer the visitor their bright facades and impressive woodwork, which conceal cool patios and shady gardens. One of them houses the “Museum of the History of Tenerife” – well worth a look. This university town has been a UNESCO World Heritage site since 1999; its layout, that of the first non-fortified Spanish colonial town, served as a model for many towns in the Americas. The Botanic Garden, with Puerto de la Cruz and La Orotava and its valley. You will see, with a knowledgeable guide, the “Jardin de Aclimatisación” of La Orotava – the Botanic Garden founded by Royal Decree in 1788 to house the plants being brought from the New World by the ‘Discoverers’ who (Columbus included) used Tenerife as a jumping-off point for their epic voyages. The garden’s role was as a trial ground for plants and trees that would be of important medical or economic benefit to Spain as a whole. Designed to a geometric plan, it has a particularly impressive collection of trees, including date palms and fig trees, as well as an enormous oriental plane tree (platanus orientalis), at the base of which the garden’s founder planted a box of coins and documents. There are also good collections of agave, hibiscus, orchids, poinsettia and jacaranda. This day will also include a visit to Orotava town and an orientation of Puerto de la Cruz. A further, optional excursion will also be available to Santa Cruz de Tenerife. Previously called Diverhotel Tenerife Spa & Garden. the hotel stands on the edge of Puerto de la Cruz, a 25 minute walk to the seaside promenade (free courtesy bus 6 days a week during the day).There are views to Mount Teide, the sea, and the Orotava valley from the hotel’s extensive tropical gardens (1500sqm). Rooms have bath/shower, wc, hairdryer, satellite tv, safety deposit box (charge applies), minibar, and balcony or terrace. There is an outdoor pool, spa (charges apply), poolside bar, entertainment programme, buffet restaurant, and lounge area (limited free wifi). Prices are based on standard rooms. Rooms with a view of Mount Teide are available at a supplement. Extend your holiday – extra week available in our hotel in Tenerife.